Hot water is a luxurious aspect of modern living – particularly on a cold winter morning. But hot water is also necessary for many aspects of our daily lives. We need hot water for our washing machines, for running our dishwashers and, of course, showering, among many other uses. This is why it’s crucial to maintain well-functioning water heaters and to replace them when necessary. The average water heater usually lasts for approximately one decade. 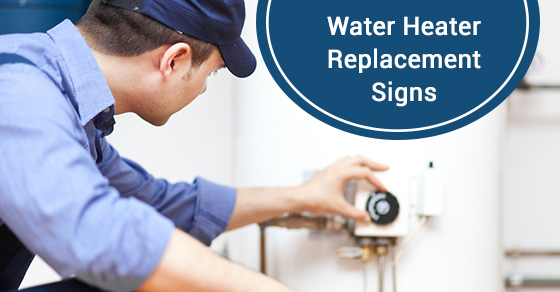 Below are some of the most common signs that you might need to replace your water heater. You can determine whether or not your water heater is leaking by doing a simple, physical inspection. You should pay particular attention to the base of the water heater, as well as any connecting areas and fittings. If you see any water or sludge, it is likely time to replace your water heater. While doing this physical inspection, you should also pay attention to any rust that might have developed. If there are any visible signs of corrosion, then your water heater is probably leaking – even if you don’t see any water. Again, any sort of rust or corrosion is a clear sign that your water heater needs replacing. Another obvious and surefire sign that your water heater needs replacing is a gauge of its simple functionality. If you’ve noticed that your water is not as hot as it used to be, or that you are not getting as much hot water as you were before, there is a good chance that your water heater is to blame. If you notice that your water has a metallic taste, or that it has a noticeable buildup of sediment, perhaps in the form of noticeable flakes, then you probably need to change your water heater. The same applies if your water has changed colour. A common sign of this is muddy or sandy appearing water, or water that is a slight rust colour. Finally, if you have not changed your water heater for a long time, there is a good chance it needs to be changed. Most water heaters last for around 10 to 15 years. If you are in need of reliable, professional plumbing services, consider Brothers Plumbing, a leader in the industry. Not only do we have over 50 years of experience in plumbing and heating, but we also offer very affordable rates and offer our services seven days a week. Contact Brothers Plumbing today.